The growth of human colon cancer cells (raised in culture) is unaffected by presence or absence of MELK. Top row: untreated cells; bottom row: cells treated with a MELK inhibitor. Left two columns, control cells; right two columns, cells in which MELK gene has been knocked out. 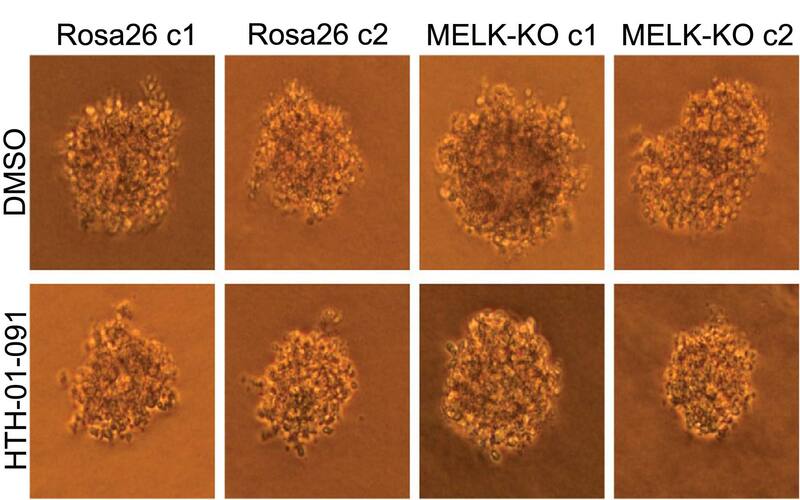 CSHL researchers conclude that MELK is not involved in cancer proliferation. Science is self-correcting. Case-in-point: using CRISPR technology not available until recently, a CSHL team has shown that MELK, a protein thought to be overabundant in cancer and hence a target of developmental cancer drugs, is not involved in cancer. Cold Spring Harbor, NY — About 10 years ago, several labs discovered that a gene called MELK is overexpressed, or turned on to a high degree, in many cancer cell types. This evidence has prompted multiple ongoing clinical trials to test whether drugs that inhibit MELK can treat cancer in patients. Now, Cold Spring Harbor Laboratory (CSHL) researchers, led by CSHL Fellow Jason Sheltzer, report that MELK is not actually involved in cancer. Giuliano, CJ et al, “MELK expression correlates with tumor mitotic activity but is not required for cancer growth,” appeared online in eLIFE February 8, 2018.